After the startling midseason finale reveal that Sophia(Madison Lintz)had been a walker all along, this week’s return to “The Walking Dead” dealt with reactions to the bitter end of a failed search and rescue attempt. It came as no surprise that Hershel (Scott Wilson) demanded our ragtag group of travelers leave the farm after breaking into the barn where he was keeping his now turned walker family, but Sophia’s transformation and death placed a strain on everyone. 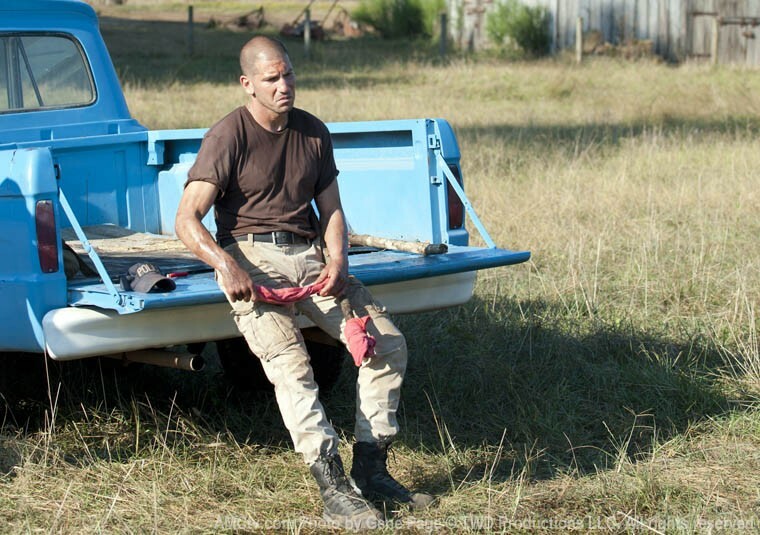 Rick (Andrew Lincoln) and Shane (Jon Bernthal) are still alpha-male battling to be the top dog, but Rick was now shaken that his decision to continue the search for Sophia led to naught. The show managed to give ample glimpses into each character's grieving process and varying stress levels (mostly high), including some character interactions that have been less developed. Shane and Carol (Melissa McBride) shared an interesting scene in particular, and Dale (Jeffrey DeMunn) finally confronted Lori(Sarah Wayne Callies) with his belief that Shane killed Otis (Pruitt Taylor Vince). Amidst all the emotional drama, Hershel went missing, and Rick, who still feels the need to be everybody's hero, took Glen (Steven Yeun)and decided to go looking for him. Rick and Glen found Hershel at the town bar, and it was hard to tell if it was the weight of the death of his walker family or the alcohol, but Hershel's transformation was of the more interesting we've seen: His new barfly self now defeated as he admitted to being wrong that the walkers could be cured and spiraled into hopelessness. The moment was soon interrupted by two newcomers, Tony (Aaron Munoz) and Dave (Michael Raymond-James), who were from another traveling group. It was an uncomfortable and tense scene as each group tried to feel the other out. Dave and Tony were digging for information on the other's safe haven, and the tension culminated with Rick shooting both of them before Greddo, I mean Dave or Tony, could shoot first. I'm just glad they didn't stick around, as the show doesn't need more characters, and they served their purpose of delivering the news that Fort Benning wasn't safe anymore. More interesting was how they brought to Rick and Hershel the same points that Rick brought to Hershel when he came to the farm, and now Rick was playing Hershel's role of not letting anybody else into the camp. Things came full circle, and Rick wasn’t going to take any chances. Regardless, the bar scene dragged on far too long: I understand the need to have people from the outside bring the news of Fort Benning, but did we need to spend so long with them? I'm also not sure why Laurie headed off on her own(stupid decision) but her hitting one walker and then pulling a “2 Fast 2 Furious”collision was a little extreme, and also unnecessary. Oh vey. The strengths of the episode, and of the show, for that matter, was how well it grasped the overall atmosphere amidst everything else going on. The music was spot on this week, and while the episode was a little backheavy and slow, time did need to be given to grieve Sophia. I just hope the grieving process is a shorter than the searching was.